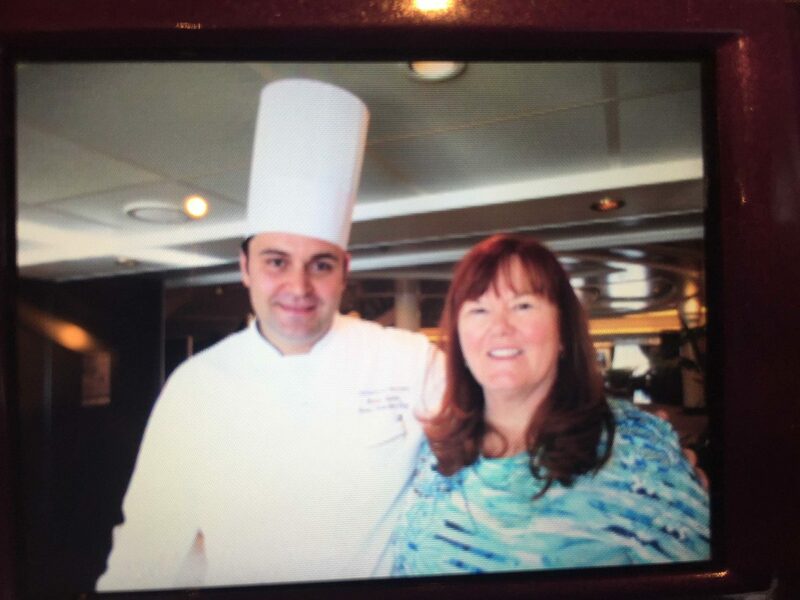 Chef Alban and My Friend Karen during our interview! 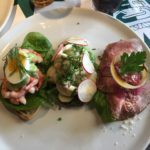 Our Baltic cruise began in Stockholm-Sweden, with stops in Tallinn-Estonia, St. Petersburg-Russia, Helsinki-Finland, Gdansk-Poland, Berlin-Germany, Copenhagen-Denmark, Oslo-Norway and we disembarked in Southampton-England (just about two hours south west of London). 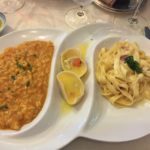 This epic itinerary allowed us to visit two spots that have had on our “bucket list” for some time. A visit to the Hermitage Museum was so impressive. It was magical, historical, and truly epic to see these famous works of art. Most have not been seen outside of this museum. Exploring the wonders of St. Petersburg, Russia was a real treat. And on the back-end of our sojourn, to visit Stonehenge (just outside of Southampton) was equally impressive. It was a fabulous trip and we enjoyed exploring all of it with our good friends from Southern California. So much of my research and writings revolve around food. I love to cook, have an instant affinity for a chef’s passion and early beginnings and I am rather intrigued by the inner-workings of a ship! How do the Harbor Pilot’s get on and off the ship? In what ports-of-call will the kitchen be picking up fresh provisions? How on earth do they serve so many people in this myriad of different venues morning, noon and night? 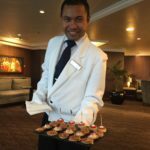 I was honored to arrange a brief interview with the Executive Chef and learn more about his world on-board the Marina cruise ship. I am very respectful of their time and set my alarm for 15 minutes. I do not take more of their time. Meet Senior Executive Chef Alban Gjoka. He has been with Oceania Cruise Lines for about twelve years. 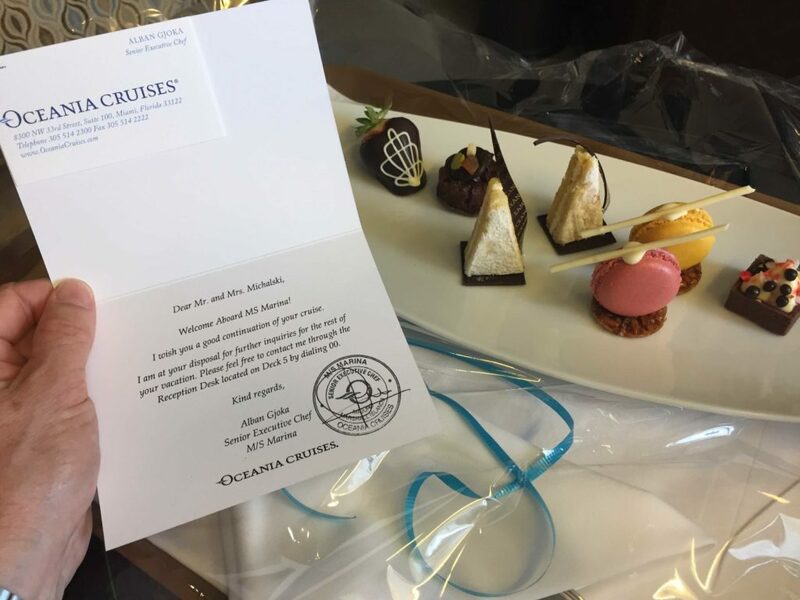 He is one of three Senior Executive Chefs in the Company and together as a Corporate Team they collaborate on: staffing, overall menus, procurement, trends, seasonal produce, new offerings, special events, reading through the comment cards, chatting with passengers, and so forth. His responsibilities on-board are rather daunting, yet he approaches it with such a calm demeanor. I assume you have to be wired like that to take on this level of responsibility. We met at 5:00pm on the fourth day of our cruise to chat in an alcove of the lobby. I set my timer… as I am very respectful of his precious time. 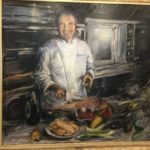 I have interviewed probably 50 chefs in my day, but as we sat down I was instantly so impressed by his calm style and willingness to “be here now”! That is so rare, but what sets the stage for such success is meeting him “outside” of the kitchen environment. So guess what happens next? He informs me that at 5:30pm he will be racing off. Each evening the Chef saunters from kitchen to kitchen grabbing a spoon and testing sauces, entrees, and appetizers. He is tasting to make sure everything meets his level of perfection. If something is not to his standards, they start over but luckily that does not happen often. Between the detailed recipes, menus, pictures of plating and years on the line, the do-overs are a rarity. 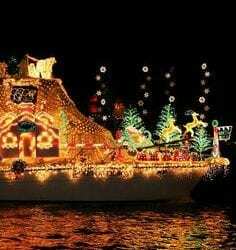 So while I am sipping on Champagne, applying my make-up for dinner, and slipping into my “little black dress” this is what is going on below-deck. I am so impressed, and honored—all at the same time. The cuisine shines with his impressive attention to these details each and every day. This wonder-kin has spent 24 years in the kitchen. But this all began many years ago in Italy. He grew up in Lago de Lombardia (between Verona and Milano). His home town is located in northwestern Italy bound on the north by Switzerland, on the east by Trentino-Alto Adige and Veneto (Venice), on the south by Emilia-Romagna and on the west by Piedmont. This area is famous for its olive oil and sparkling wines. At home in his youth, Sundays were all about family and that meant 40-60 people together for Sunday lunch. Alban’s Grandmother and Grandfather would cook all the food and everyone enjoyed their cuisine and family-time together. After their passing, his Mother tried to continue the tradition, but it was not as successful. The lunches dwindled and that is when Alban stepped in. Even though he was only the tender age of ten years old, he was motivated to return the family unity. He knew that delicious, yet simple food was the foundation of family and friends. Meeting around the table was essential and luckily he was able to turn this tradition around for his fmaily. Through this process he realized that cooking was a real passion. Chef Alban explained to me that emotions are transmitted to your food as you cook it. He feels that if you are happy, the food you create in the kitchen will reflect that. Right as rain Chef! 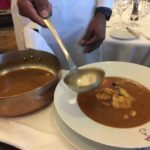 I was shocked to learn that Chef Alban’s team is much larger than the Captain’s cadre of navigators and those minding the bridge. Wow, I knew the cuisine was top on MY list, but I had no idea ! 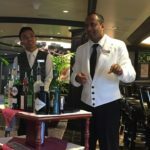 On the Marina Ship with up to 1,200 passengers, the Captain has a crew of 110 Navigators and Bridge personnel and the Chef has a crew of 210 in the kitchen. They operate like an army, as described to me—-“Discipline and Respect” are the cornerstones of the kitchen decorum. Yes Sir! 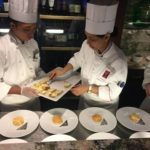 All the way up the chain of command, cooks have spent 2-3 years at each of the ten levels before attaining the premier job of Executive Chef. This includes: Assistant Chef Cook, Chef de Private, Junior Sous Chef, Sous Chef, Chef de Cuisine and Executive Chef. The Executive Chef orchestrates so much—from schedules of staff, to menus, planning and procurement, ordering, various seasonal changes, venue changes, and so forth. 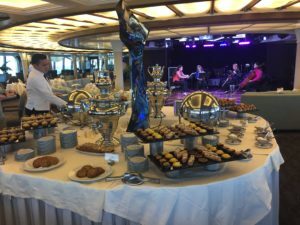 Unlike a river boat (with 190 passengers or less), the Chef on this cruise liner is not able to shop at local markets. Between various public health guidelines, taxes they would have to pay, and the huge quantities they require…these are all considerations for ordering ahead of time and securing the items in a specific pre-arranged location along each route. 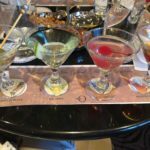 An Afternoon of Tasting in the Martini Bar... my favorite spot for a pre-dinner cocktail… or two! Oceania has managed to facilitate an organized approach for logistics such as this. When the ship needs 10,000 pounds of potatoes for a cruise (and all of a similar size), that takes ordering to a whole new level. Certainly there are specialty items that are in-season locally, such as cherries, on our trip, but for the most part, these purchases are rare. 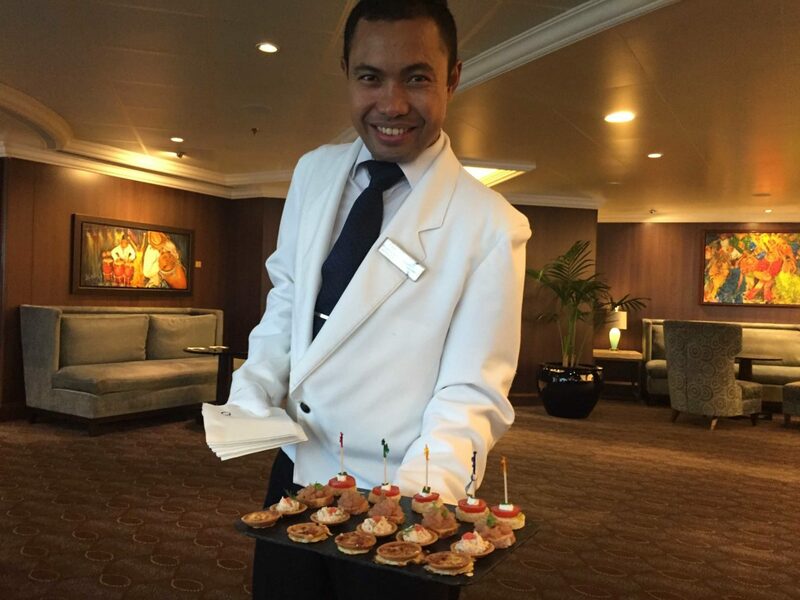 The La Reserva Wine Dinners are a special treat while on-board. 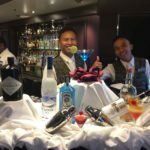 They offer 3-4 per cruise and well worth the up-charge! Sneaking a peek at the plating! Chef Alban Welcomes Us All! For domestic United States, Oceania has a procurement center in Miami (near their main office) and in Europe there are various cities for stocking up, such as Barcelona. For our trip they were stocking up prior to departure in Stockholm and stocked up again in Copenhagen. Each route has their key cities for restocking. The freshest produce and largest market is located in Amsterdam. 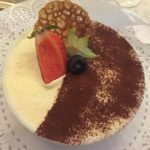 Toscana is one of our favorites as it is authentic Italian! On this ship they can carry enough food product for 18 days and they work toward a 10-12 day time-frame. On this trip, for example, it will be 8 days between provision replenishment. The Culinary Department of Oceania has very specific standards for every single item they order. Given the volume purchased, the vendors are careful to accommodate the specifications for beef, potatoes, produce and so forth. 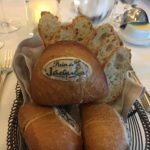 Jacques French Restaurant is always such a treat!!! We pretend we are in France. 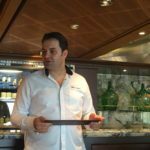 Chef Alban Gjoka was so kind to spend time with me and share his background and a little glimpse into how things work in the kitchen ono-board the Oceania Marina. 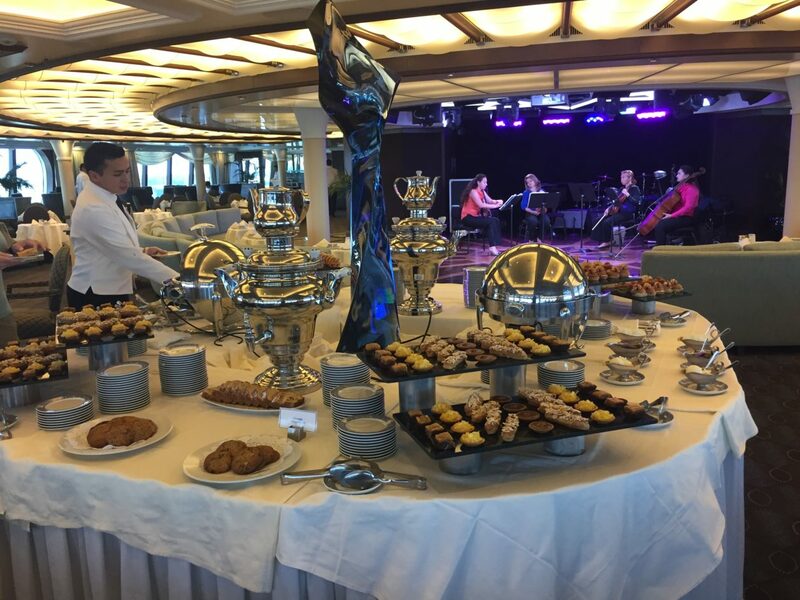 Culinary excellence on the high seas! And in just a few months I will be back out there heading to Amsterdam for a Rhine River Cruise. Bon Voyage—-here’s a toast to eating well and my many thanks to passionate chefs like Chef Gjoka! 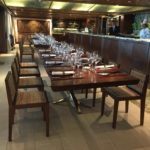 Below, please enjoy perusing the many dining and culinary venues on-board the ship, as well as a recipe from Red Ginger. This is my “favorite bite” and I worked hard to secure this recipe for us all to enjoy! 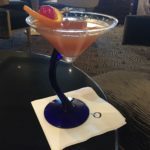 Since many of my readers may not have had the pleasure of being on the Marina ship, I thought I would take a moment and provide you with a quick overview of the various (and impressive) venues on-board the Marina ship. This is an elegant dining room offering sit-down table service for breakfast, lunch and dinner. Handsomely decorated in rich woods, designer tapestry fabrics and oversized armchairs, the expansive dining area exudes classic splendor. Tables are beautifully set with bone china, sparkling Riedel crystal, gleaming silver, and fine cotton linens. There is a dress code and a tad more formal than at the Terrace Café. If we are casually dressed we opt for the buffet at the Terrace, however we often like to dine in the Grand Dining Room and find that just about any request can be found on this robust menu. The wait staff is gracious serving course after course of European-inspired cuisine or delectable alternatives such as light and healthy Canyon Ranch Spa Cuisine and gourmet vegan options. The Terrace Café is more informal and inviting with various food-stations around the center. Each station is manned with staff, which I like to see. I do not like various guests handling the food (and so many do not have good manners to use the utensils provided). Guests can dine inside or alfresco at one of the shaded teak tables on the outside terrace. This is at the back of the ship and offer has great views. My favorite spot to be! First thing in the morning, we enjoy sumptuous breakfast selections and many items are made to order. Come lunchtime, the expansive menu of international-inspired dishes changes entirely. They offer flavorful roasted and rotisserie meats, soups, salads, pizzas and so much more. This is perfect if we are returning from a shore excursion and ready for a quick lunch. In the evenings, the wait staff shines, and the cuisine takes on a more sophisticated flair— such as: Lobster tails and lamb chops, freshly made hand-cut sushi and sashimi. The menu changes daily. Casual dining during the day can also be found poolside at the Waves Grill. Munching on all-American favorites, such as gourmet burgers, seafood, hot dogs, salads, and hand-cut truffle fries. Located in a spacious, shaded area steps from the swimming pool, Waves Grill also has vegan smoothies during breakfast at the Smoothie Bar. All of these restaurants are excellent and honestly I do not have a favorite. We enjoy visiting every single one of them during our cruises! Guests can book one reservation at each restaurant, however those in the premier Suites have priority and their butlers book reservations ahead of the other guests (which is fine by me). Polo Grill is a classic steakhouse. The decor features crisp, white linen tablecloths, dark wood furnishings and comfy, high-back, burgundy leather chairs. Each course boasts time-honored favorites and all of the beef served is USDA Prime and dry-aged for 28 days to enhance tenderness and flavor. Succulent seafood dishes such as Grilled Swordfish and Whole Maine Lobster Gratinée are also quite popular in their own right. The Classic Caesar Salad is prepared tableside with lots of fanfare. Many of the recipes originated with the mothers and grandmothers of their own Italian culinary staff. 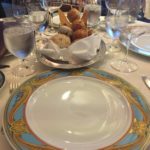 Presented on elegant, custom-designed Versace china, masterfully prepared dishes exemplify the essence of Tuscany and celebrate Italy’s culinary passion. 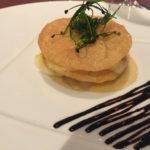 Some evenings begin with an appetizer of Octopus Carpaccio with Champagne Vinaigrette or the Artichoke and Parmesan Cheese Timbale with Black Truffle Sauce. Classic dishes from other regions of Northern Italy are featured as well, such as their Minestrone alla Genovese. 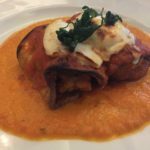 My favorite is the Lasagne al Forno alla Bolognese and my husband’s favorite is the Osso Buco alla Milanese. 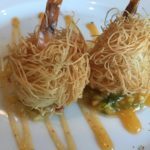 Red Ginger’s chefs have created contemporary interpretations of Asian classics. The interior simply glows with ebony woods, a soothing waterfall wall and striking red chairs and modern Asian artwork. To complement the stunning decor, Red Ginger’s chefs have created contemporary interpretations of Asian classics. A “not to miss” Starter is the Salad of Spicy Roast Duck and Watermelon with Cashews, Mint and Thai Basil. (SEE BELOW FOR THE CHEF’S RECIPE.) Other popular menu items include: the Malaysian Beef Penaeng with Coconut Rice and Paratha Roti and the Thai Vegetable Curry with Sweet Potatoes, Aubergine (eggplant), Mushrooms & Basil in a Green Curry Sauce. Exquisitely decorated with heirloom antiques, pickled wood furnishings and art from Jacques Pépin’s personal collection, Jacques Restaurant was modeled after a Parisian bistro. Comfortable and eclectic, the ambiance is pure French, as is the cuisine. There is a rotisserie in view, where chicken, duck, pork, beef and veal roasts are slowly turning. Each dish is a classic, from recipes by Master Chef Pépin. The Coq au Vin is not to be missed. (I have made it at home and 25 steps later—oh my goodness!) His Steak Frites pair with the prime beef perfectly. Jacques is absolutely magnifique and his CD’s on cooking are excellent! He was on one of our other cruises and signed my copies for me. It was quite special. 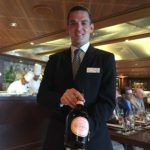 La Reserve by Wine Spectator- Three or four special dinners are offered during each cruise on the Marina and Riviera ships. A special dining room has been created for these three special dinners. 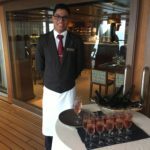 Oceania Cruises brings guests the brilliant union of La Reserve and Wine Spectator, a well-known magazine for wine connoisseurs. 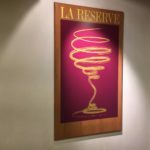 The result is La Reserve by Wine Spectator which offers not only wine seminars and vintage tastings but also gourmet dinners pairing fine wines with delectable courses. 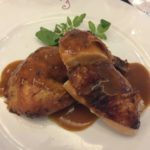 A fairly new, seven-course elegant affair, La Cuisine Bourgeoise celebrates flavors with wines that complement the history of the dishes, many of which Master Chef and Executive Culinary Director Jacques Pépin has enjoyed since his childhood. 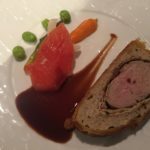 Even the most devout epicureans will enhance their appreciation of fine dining at its best with these perfect pairings which are served family style. While we were on-board they were filming a video of this fairly new offering with Jacques and everyone was quite excited about it. These are open for dinner on-board Marina & Riviera only on select nights and for an additional cost. Reservations are required. The Dom Pérignon Experience is a spirited Champagne pairing dinner blending playful Dom Pérignon vintages and refreshing gastronomic surprises such as Sakura Tea “Geisha Flower” Ice Cream and Lemon Caviar. From Brittany Blue Lobster in Yellow Curry Broth with Coco Foam to Sashimi-Style Seared Wagyu Beef with Sautéed Arugula, Blood Orange-Soya Jus and Caviar Perlita, each beguiling bite is a celebration of the finer things in life. While the Dom Pérignon Experience is the perfect complement to any joyous occasion, it transcends even this lofty role. In true French spirit, it becomes the culinary manifestation of joie de vivre. Reservations required. Guests often want to host a private party and Privée is just a perfect dining room for up to 10 guests. This private dining room sits between the Polo Grill and Toscana! Guests can order from one or the other, or both! The exquisite setting is adorned with Baroque mill-work, a dramatic custom-built table designed by the famed Dakota Jackson, and is illuminated by a golden Venini chandelier. Reservations required. A room reservation surcharge applies. This delightful coffee bar offers java lovers complimentary espressos, cappuccinos and lattes. Delicious pastries, finger sandwiches and homemade biscotti are also available all day long. Open daily until early evening. My favorite is the Martini Bar with piano music and an upscale vibe. There are other bars as well… poolside at Waves during the day, Horizons, and near the Casino in the evening too! There are a multitude of special events, all requiring appetizers and meals too, such as: the Captain’s Cocktail Reception, Oceania Member-only Reception, and Private Parties and Receptions. Of course there is a Cafeteria for the staff on-board the ship. 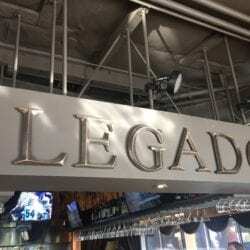 Serving breakfast, lunch and dinner—-however I have never visited this venue. I bet snacks are also readily available too. This is available in the suites and staterooms. I have to admit I have never had room service. I am too excited to get out and about. 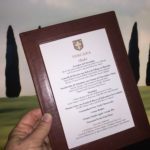 But the menu is extensive and I am sure perfect for those who are a bit tired from a day of exciting excursions, or in the morning when greeting the day. Available 24 hours a day! 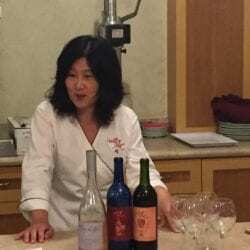 Here are some of the classes that can be found in The culinary Center. Guests can sign up prior to boarding the ship and it is so fun if you enjoy hands on cooking and learning new techniques. Onboard Cooking Classes: All Things Roman, Cuisines from Morocco and Turkey, Brunch Comfort Foods, Essential Pasta, Greek Cuisine, Grill School, Secrets for Cooking Fish, In the Kitchen with Jacques, Most Requested Red Ginger, Rethinking The Crepe, Love and All Things Lemon, Mastering Chef Knife Skills, The Nordic Kitchen, The Sicilian Kitchen and Viva España (Spain)—just to name a few! This salad has become one of the true favorites of Red Ginger and is my favorite bite here. I will not tell you what I had to do to get the recipe but believe me it took a lot.You’re Welcome! Duck Confit is a traditional ingredient for a French Cassoulet, but here they paired it with watermelon for a fresh and savory salad. 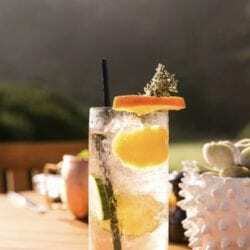 This can be served on a plate or in a martini glass. -In a medium saucepan, combine the palm sugar and water. Place over medium heat, and heat and stir occasionally, until the sugar is melted—about 5 minutes. -Remove from the heat, stir in the shallot, lemongrass, lime leaf, and galangal and let sit at room temperature to cool and to infuse the flavors for at least one hour or overnight. -Strain the liquid through a fine-mesh strainer into a small bowl. Discard the solids. -Add 1 tablespoon of both the fish sauce and tamarind and mix well. 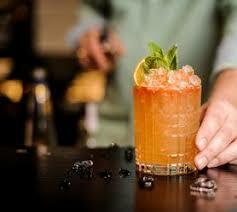 -Taste and adjust as desired. Set the sauce aside at room temperature. Note: Can purchase cooked Duck at an Asian restaurant vs. purchasing and cooking at home as described below. -Pour 4 inches of canola oil into a large deep saucepan and heat to 325 degrees F on a deep-frying thermometer. Line a small plate with paper towels for draining the cashews and a larger plate for draining the duck. -Add cashews to the hot oil and fry until crispy about 1 min. Using a slotted spoon transfer to the towel-lined plate. Sprinkle with salt while still hot. -Increase the temperature to 350 degrees F. Add two duck legs to the hot oil and fry, turning to brown on all sides until crispy… 4-5 minutes. Using tongs transfer to a towel-lined plate to drain. Repeat with the remaining duck legs in two batches. -When the duck legs are cool enough to handle, peel off the skin form each leg in as large a piece as possible. Cut the skin into strips and set aside. Bone the legs and shred the meat into a bowl. It is suggested to “season to taste” with the hoisin sauce. In a separate bowl, combine the watermelon, basil, mint, and cilantro. Add the duck meat, duck skin, cashews and shallots. Toss with enough of the sweet fish sauce to coat lightly. Can always add a bit more and may not use all the sauce. Celebrating 11 years, this year’s Orange County Restaurant Week will be the best thus far! There are three events to keep in mind. 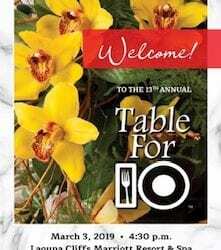 First is the LAUNCH PARTY for Restaurant Week on Saturday afternoon, March 2, the AFTER PARTY upstairs in the late afternoon and evening on Saturday March 2nd and a full week of Restaurant Dining from March 3-9, 2019. Ready, set, go! Here is a quick overview of all three and what is not to miss! This is “THE” fall charity event of the season, as we honor The Alzheimer’s Family Center. And what better way to do that than with a focus on “culinary luminaries” right here in Orange County.